Birds in tropical climates face predators- larger birds, mammals and snakes- who rob their nests, stealing eggs or killing chicks. In a study published in The American Naturalist, scientists report a novel nesting strategy adopted by a tropical lowland bird that inhabits an area with high losses to nest predators. The newly hatched chicks of the Cinereous Mourner in Peru have downy feathers with white tipped long orange barbs. The nestling moves its head slowly from side to side in a way typical of a poisonous caterpillar nearby with similar size and coloration as the nestling. The nestling tricks predators into thinking that it is a toxic, spiny caterpillar rather than an edible nestling. This remarkable adaptation decreases nest predation. Even chickens exhibit intelligent behavior within just a few hours of hatching. 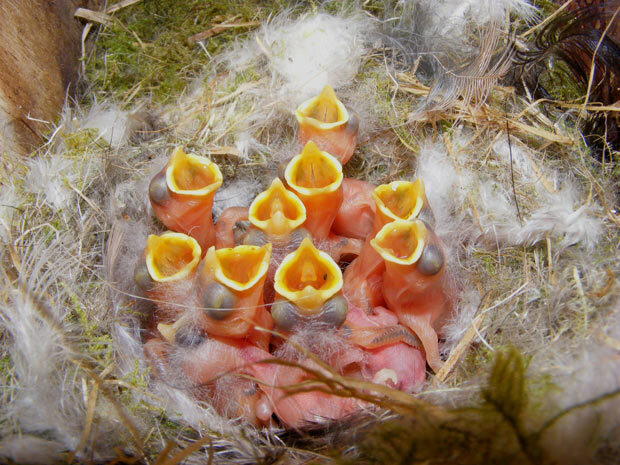 Newly born chicks are able to keep track of numbers up to five. When given a choice between two groups of plastic eggs they invariably choose the bigger one, even when the decision was between two eggs or three. And their mathematical ability does not end there. In a paper, The Intelligent Hen, spanning 20 years of research, Professor Nicol proves that the birds are born with an understanding of physics – and particularly structural engineering. This is demonstrated by experiments in which they showed more interest in a diagram of an object that could actually be built rather than one that defied the laws of physics. Experiments also showed that very young chicks understand that an object that moves out of sight still exists. It takes human babies two years to grasp the key concept that out of sight does not mean out of existence. Chicks also show basic empathy and can plan ahead and exhibit self-control until the time is right. For instance, birds quickly learnt that if they waited longer to start eating food, they would be allowed access to it for longer. Further evidence of hen intelligence comes from tests showing that at just two weeks’ old, they can navigate using the sun, something that requires the creatures to take account of the height and position of the sun during the day. Even newborn ducklings, according to a study in Science journal, challenge our idea of what it means to be a birdbrain. Zoologists at the University of Oxford devised an experiment. 1-day-old ducklings were exposed to a pair of moving objects. The two objects were either the same or different in shape or colour. Then they exposed each duckling to two entirely new pairs of moving objects. The researchers found that about 70 percent of the ducklings they studied preferred to move toward the pair of objects that had the same shape or colour relationship as the first objects they saw. In other words, a duckling that was first shown two green spheres was more likely to move toward a pair of blue spheres than a mismatched pair of orange and violet spheres. Ducklings go through a rapid learning process, called imprinting, shortly after birth— it’s what allows them to identify and follow their mothers. These findings show that ducklings use abstract relationships between sensory inputs like colour, shape, sounds and smell to recognize their mothers– meaning that an animal baby can learn relationships between concepts without training. What is animal intelligence? Life has taught me that the answers are irrelevant: it is the questions that are important. A new book called “Are We Smart Enough to Know How Smart Animals Are?” by Frans de Waal argues that the mental powers of animals are far more complex than often generally assumed. Many scientists have been asking the wrong questions about animal intelligence, blaming the creature in the cage for poor test results when it’s the person in the lab coat who is flawed. It’s a mistake to compare animal intelligence to that of humans instead of seeing it on its own terms, he writes. The Clark’s nutcracker, a bird, can remember exactly where it put many of the 20,000 pine nuts it buries each year — but people forget where they put their car keys all the time. Young bees can solve complex mathematical problems which keep computers busy for days, researchers from the School of Biological Sciences, University of London have shown. The tiny insects are able to calculate the shortest possible route between flowers discovered in random order. The classic puzzle involves finding the shortest route that allows a travelling salesman to call at all the locations he has to visit. Computers solve the problem by comparing the length of all possible routes and choosing the one that is shortest. Bees manage to reach the same solution. When researchers showed them a bunch of artificially controlled flowers, the foraging bees took one look at the place and were instantly able to figure out the shortest route between them After exploring the location of the flowers, bees quickly learned to fly the best route for saving time and energy. The author says that chimpanzees might do better at cognition studies if somebody tickled them first, rather than scaring them by separating them from their parents. And the same applies to rats and fish. If you really wanted to know, signs of animal intelligence are all around you. When you eat and abuse an animal you are really eating someone as bright- if not brighter – than you. The only thing that makes the animal “stupider” is that it refuses to learn violence for violence’s sake – something that a human child is taught in its infancy by watching its parents be cruel to the rest of the world.